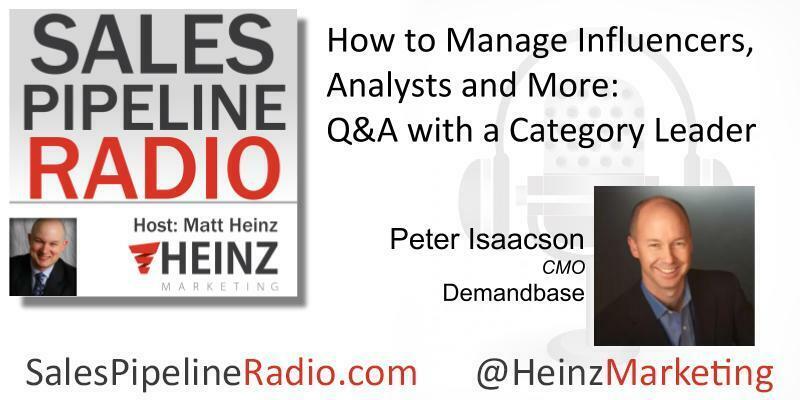 In this episode, we talk to Category Leader, Peter Isaacson, CMO at Demandbase about How to Manage Influences, Analysts and More! You can read the full transcription of this episode on the Heinz Marketing Blog starting Monday, 7/2/18. Matt: The easy thing to do on this conversation would be to talk about account based marketing. Demandbase is one of the leading providers of account based marketing technology to B2B companies. You guys do some amazing work in the space, but I’ve been particular impressed with the work you and your team have done with influencers and to create influence among third party experts in the market. So I wanted to spend a little time talking about that because I know a lot of our listeners on the sales and the marketing side, there’s a lot you can do in terms of direct marketing, but every one of us we’re marketing to people where there is a network of organizations, of individuals, of analysts, and others that are influencing their decision making as well. I think probably the best example of that for you guys more recently is the Forrester Wave that recently came out. Can you just kind of level set what was the wave about and how was Demandbase placed there? Peter: Sure. So this is a real milestone I think certainly for Demandbase but also for ABM as a category and certainly want to get into kind of category creation and the role influencers play in that. But this has been a multi-year journey for us, not just overall within ABM certainly but also with Forrester to really kind of work with them, to help them understand account based marketing, why it’s getting so much traction, why customers are getting engaged in it, things like that. Really for a category to really stand as a true category, you need a lot of things to happen, but one of the key milestones certainly is Gartner doing a magic quadrant and/or Forrester doing one of their waves around the category. That’s what happened. They just published it about three weeks ago. ABM platforms specifically and Demandbase thankfully was established as the clear leader up into the right for the ABM platform category. So very exciting. Listen in for much more! This entry was posted on June 28, 2018 at 3:43 pm and is filed under Hire Power Radio with tags Guest: Peter Isaacson. You can follow any responses to this entry through the RSS 2.0 feed. You can leave a response, or trackback from your own site.